It’s been about two months since I started baking bread at home. That’s right, I don’t buy supermarket bread ever again! 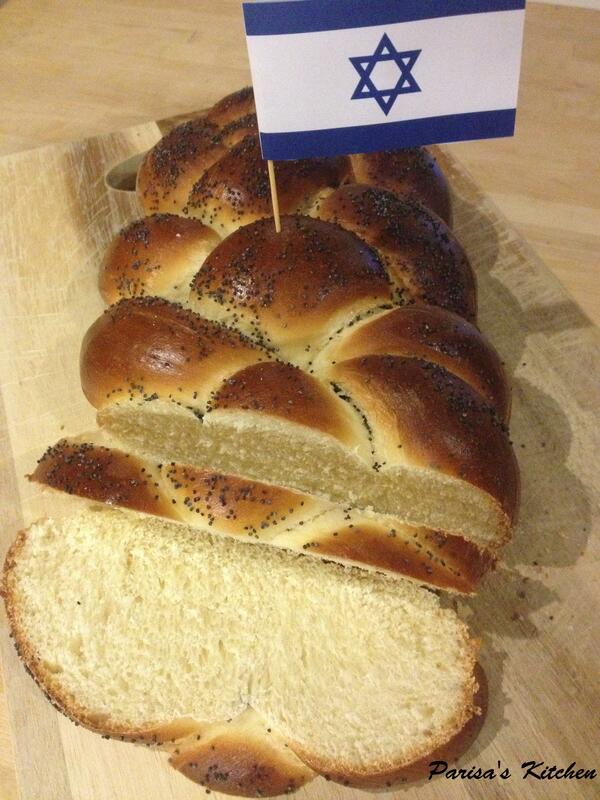 Now, the bread you see today is called Challah which in Jewish means “loaf” (plural: challot). It is a very traditional bread, eaten during Sabbath (Friday afternoon to Saturday evening meals) and holidays and can be made from wheat, barley, rye, oats or spelt (1). 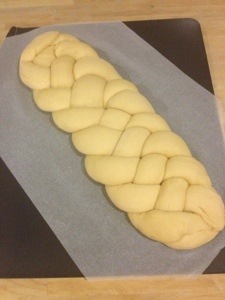 Challah bread can be in form of a wreath or a braided loaf like the one I’ve made here. 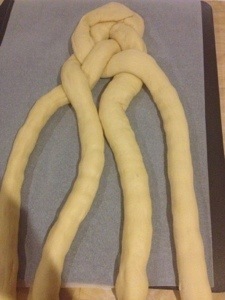 This type of braided Challah is made up of 4 braids and since these braids look like arms intertwined, it actually symbolises love (2). In Jewish tradition, Challah is a symbol of the gifts (manna) send by God to Jews in the dessert after their Exodus from Egypt. These manna were covered in dew in the morning and were sent from heavens in double portion. 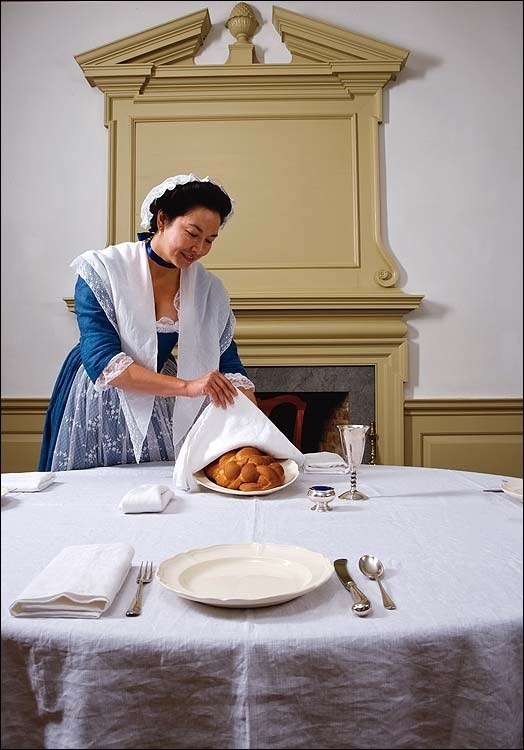 Hence, two challot in a decorative cloth (representing the dew) are placed at the table as a reminder(1). 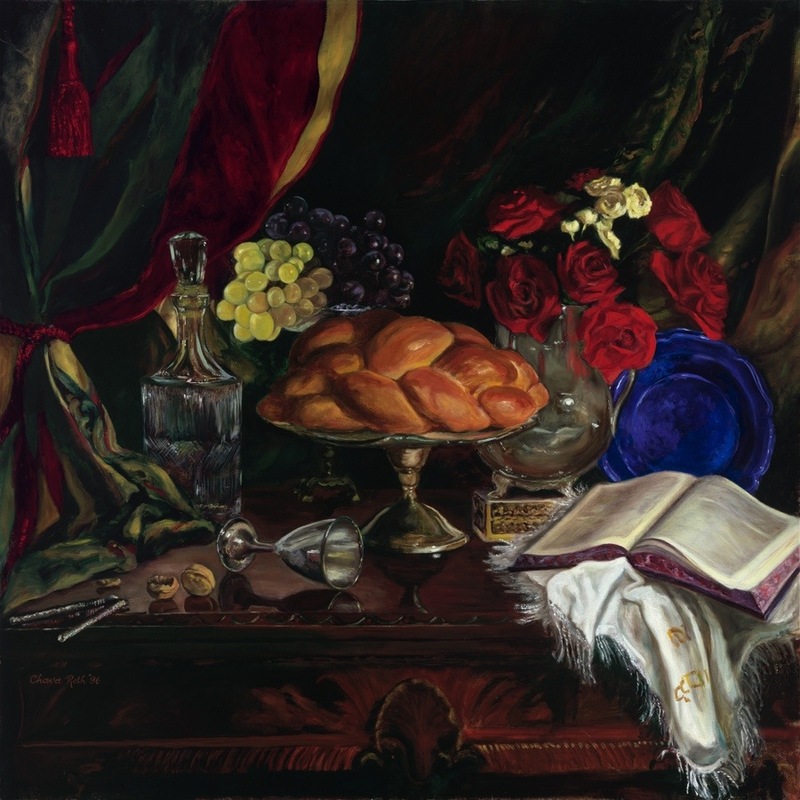 It is still a Jewish tradition to separate a small part of the dough before baking and burn it, and bake the rest of the dough to make it a blessing. The burnt piece represents the sacrifice that was presented to a priest in ancient times, and nowadays it is just burnt off as a mitzvah (1). 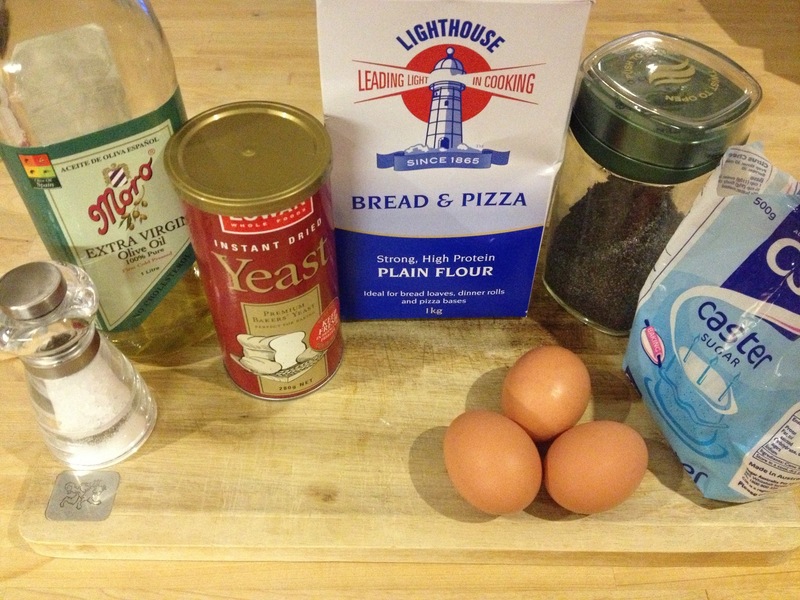 So now that you know the story behind this beautiful bread, here’s the recipe! 1. Pour 250 ml of water in a saucepan and bring to boil. Set 4 tablespoons aside in a bowl to cool to lukewarm. 2. 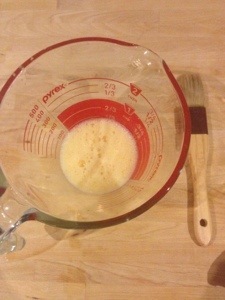 Sprinkle the yeast in the bowl with 4 tablespoons of water, let stand for 5 minutes. 3. Add the oil and sugar to the water in the saucepan. 4. Bring to boil to dissolve, then let cool to lukewarm. 5. In another larger bowl, beat the 2 eggs until fluffy. 6. Add the water from saucepan, plus yeast mixture, plus the salt to the eggs and stir. 7. 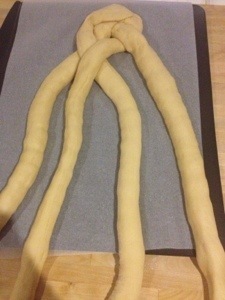 Add the flour gradually: first add half, incorporate, then add the rest and mix to combine. 8-9. 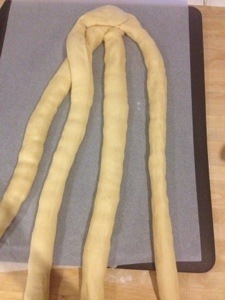 Turn the sticky dough to a floured surface and knead for 7 minutes until the dough is smooth and elastic. 10. Grease a large bowl, then place the dough in it. 11-12. 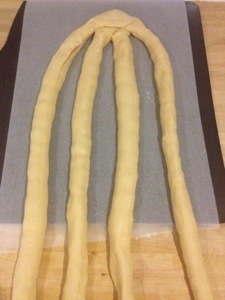 Cover with cling film or tea towel and let rise for 1 1/2 hours, or until it doubles in size. 13. 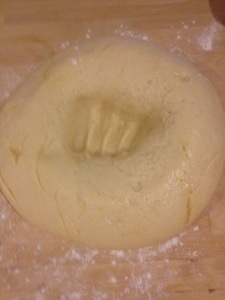 Turn the dough out on a floured surface and knock it back. 14. 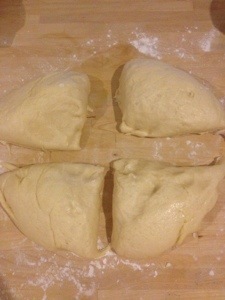 Cut the dough to 4 equal pieces. 15. 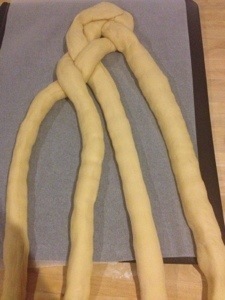 Shape each piece into a 63 cm strand. 16. 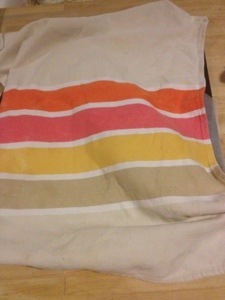 Line a baking sheet with baking paper. 18. Cover with a tea towel and let rise again for 45 minutes. 19. Preheat the oven to 190C. 20. Glaze the loaf with the beaten egg yolk, then sprinkle the poppy seeds on top. 21. Bake in oven for 35-40 minutes, until golden. KEEP CHECKING THE BREAD IN THE LAST 5 MINUTES AND TAKE IT OUT WHEN GOLDEN BROWN. 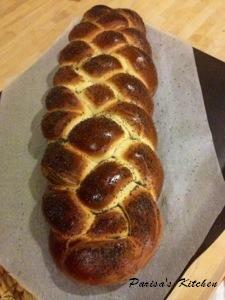 Posted in Bread, JewishTagged bread, challah, egg bread, healthy, jewish, recipeBookmark the permalink. That’s great you bake your own. I want to try one. I bet it smells great. 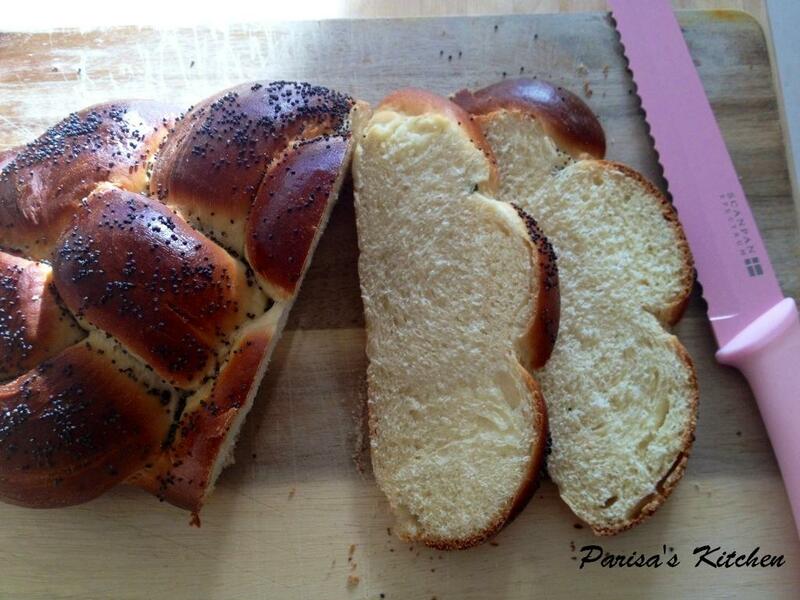 Parisa, thank you for this recipe and all the informations. 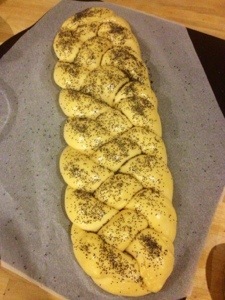 Very interesting, and let me tell you…your challah is a stunner! 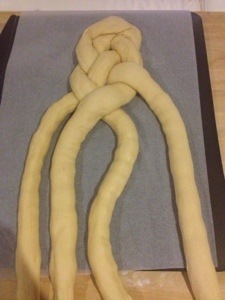 It’s not so easy to braid such a beautiful bread. It looks so perfect and divine. It is a hard job. Well done. Thank you for convincing me to start making my own bread. I have been wanting to make my own, but kept on postponing. 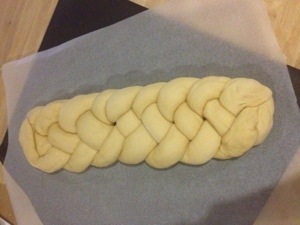 Challah and challot (learnt something new). The bread is very rich. I would love to try it. Thanks for sharing and have a lovely week!